Eight CARA scientists tested environmental, chemical, biological and explosive samples inside the mobile laboratory during Exercise Atropian Phoenix. The U.S. Army activity that analyzes and remediates chemical, biological, radiological, nuclear and explosive (CBRNE) threats recently validated its heavy expeditionary laboratory capability during Exercise Atropian Phoenix. The Aberdeen Proving Ground, Maryland-based CBRNE Analytical and Remediation Activity, also known as CARA, tested its deployable Heavy Mobile Expeditionary Laboratory (HMEL) during simulated combat operations. 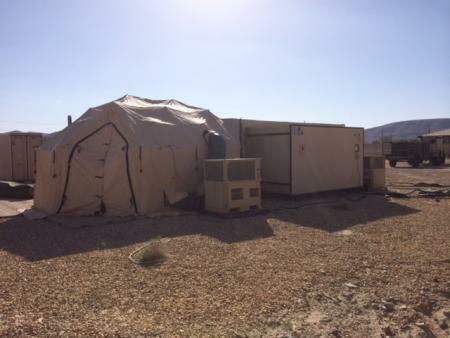 CARA’s Mobile Expeditionary Lab (MEL) participated in two National Training Center rotations on Fort Irwin this year with the Light Mobile Expeditionary Lab (LMEL) prior to deploying the HMEL for the first time. “The intelligence and information gained from the specialized analytical equipment contained within the HMEL is critical for commanders to make timely decisions and assists in the planning of WMD (Weapons of Mass Destruction) sensitive site exploitation missions at the tactical, operational and strategic levels,” said CARA Director Christopher K. Chesney. CARA is part of the 20th CBRNE Command, the U.S. Army’s only formation tasked with combating chemical, biological, radiological, nuclear and explosive threats. “CARA’s HMEL operational tempo is the highest it has ever been but this is good for the Army to understand and plan for this unique highly specialized capability,” said Chesney, a native of Chicago. “With these recent rotations, Soldiers, who have the mission to sample and package CBRNE materials on a sensitive site, all now have a better understanding of the importance of their work and the direct influence it has on decisions made at the theater level,” said Chesney. Lori Taylor, a chemist who deployed with the laboratory during the exercise, said the validation exercise enabled the CARA team to train new staff members and educate other units on the kind services and expertise they bring to the battlefield. “The most important experience for me personally has been the ability to interact with the teams collecting the samples and making sure we are all on the same sheet of music,” said Taylor, a Glen Burnie, Maryland, native who has been to multiple exercises with CARA, both stateside and overseas. “The sampling teams are in the position to provide us with the best sample possible and making sure they know all the techniques to preserve those samples are key to us being able to provide the best analysis possible,” said Taylor. “Our results help combatant commanders make decisions, so we want to make sure we are as accurate as possible. Article courtesy of Walter Ham, 20th CBRNE Command, with adaptations for context and length. Image courtesy of DVIDS.